Kobe Planet Film Archive’s film collection is based on films from all eras and places, which its parent organization Planet Bibliothèque de Cinéma began collecting in the 1970s. Although it contains many precious films that don’t exist in the collections of any other film archives, lack of resources hampered work on the collection. However, this project launched in fiscal year 2014 has allowed research to proceed. Since fiscal year 2017, digitization began in cooperation with Kobe Design University, which made it easier to undertake collaborative research with other organizations and researchers. Even so, identification of such films as those without top titles is extremely difficult. From fiscal year 2018, a plan exists to set up a new platform to make source materials – captured film frames or parts of the digitized video – accessible. Both materials that have already been researched, and those still to be worked on, will be evaluated and information on them will be gathered. As a preparation stage, at this time here is some unidentified footage that we are looking for more information on. 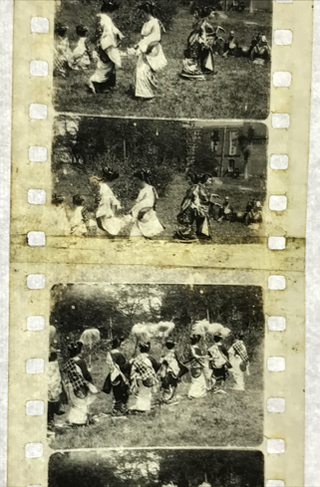 ※ According to Harold G. Brown’s Physical Characteristics of Early Films as Aids to Identification (FIAF, 1990) p. 6, up until c. 1905, perforation size was smaller than the present standard positive or negative perforations. 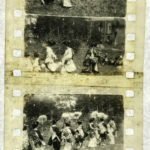 It is not clear if this film was manufactured in or before 1905. Geisha girls dancing in a garden. Usually such dancing is done indoors, but it was probably performed outside so that the shooting could take place under natural light. Dancing with a decorated spear is a particular characteristic of this film. According to two specialists of traditional Japanese dance, of different schools respectively, it possibly belongs to the Wakayagi school. Japanese Cinema Database run by Agency of Cultural Affairs lists a film titled “Ashibe Odori” (1905), though it is not clear if it is related to this film.